MOU signing ceremony, Hong Kong, December 8, 2017. Left to right: Professor Santa J. Ono, President and Vice-Chancellor, University of British Columbia; Dr. Edwin S.H. Leong, Chairman and Founder, Tai Hung Fai Enterprises. Established by a donation from businessman, philanthropist and UBC alumnus Edwin S.H. Leong, the Edwin S.H. Leong Healthy Aging Program will expand research aimed at helping people live longer and enjoy a better quality of life in their later years. Learn more about the Edwin S.H. Leong Healthy Aging Program. Two advisory councils are supporting the successful development and launch of the program. The Edwin S.H. 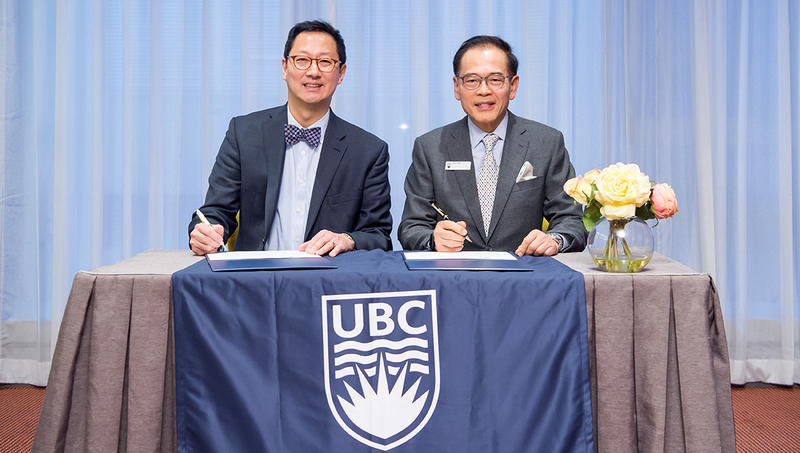 Leong UBC Chair in Healthy Aging – a UBC President’s Excellence Chair will provide the leadership for the program.